The Speckle-fronted Weaver was formally described by Francois Marie Daudin, a young French zoologist. Daudin wrote Traite elementaire et complet d'Ornithologie (Complete and Elementary Treatise of Ornithology) in 1799-1800, being one of the first modern handbooks of ornithology. Daudin combined Linnean binomial names and good descriptions of the birds. He did not complete his book, as he died before the age of 30. Daudin described the species, based on two individuals in private aviaries in Paris. He noted the origin of the birds as Senegal. The first illustration was provided by Louis Jean Pierre Vieillot, a French ornithologist. 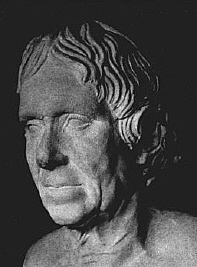 Vieillot was interested in living birds, and wrote about the difficulties of keeping Speckle-fronted Weavers in captivity, in addition to a description of the birds. Loxia frontalis	Daudin 1800	Traite' d'Orn. 2, p.445	Senegal. frontalis (Modern Latin): fronted, browed (L. frons, frontis, the brow, the forehead). Speckled Weaver, Scaly-fronted Weaver, Red-fronted Finch. Type specimen not traced (it may be in the Paris museum); the illustration of Vieillot 1805 serves as a type. Identification. The Speckle-fronted Weaver Sporopipes frontalis is one of the smallest weavers. It is finch-like, with a short stubby bill. The head pattern is distinctive (see right) - the black feathers on the crown are tipped white, giving a speckled effect, which gives rise to its name. The nape is chestnut and there is a black moustachial streak surrounding the broad pale grey face. The sexes are alike. The juvenile is like the adult but paler, especially on the nape, which is tawny rather than chestnut. 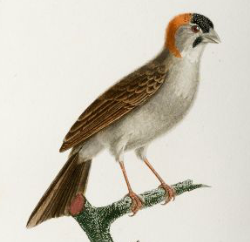 The Chestnut-crowned Sparrow-weaver is much larger and has a chestnut crown and ear-coverts. 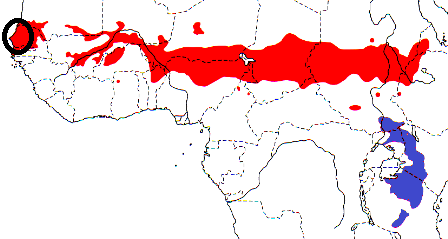 S. f. frontalis from Mauritania, Senegal and Gambia across the West African savanna belt to Ethiopia and Eritrea (see red on map). S. f. emini, South Sudan and Uganda south to Tanzania (see blue on map). The mantle of this subspecies is darker grey than in the nominate. Projected climate change is thought likely to increase its range in the future. Habitat. The Speckle-fronted Weaver inhabits dry bush and open thorn-scrub savanna, and thickets, often around villages. It roosts in groups in old nests throughout the year. When not breeding, it is generally gregarious. Birds allopreen, mainly the head. It moves locally during the rains in Mauritania and is apparently present only during the wet season in the sahel zone of Nigeria. Post-breeding wing moult starts in mid-March, and lasts at least 5-6 months in Nigeria. In occurs in pairs during the breeding season and in flocks of 5-10, sometimes 20, at other times. Food. Food of the Speckle-fronted Weaver consists of seeds, some small insects (picked up on the ground), and termite alates. It feeds mainly on the ground in open gravelly patches, often alongside waxbills. The Speckle-fronted Weaver moves by hopping. Breeding. The Speckle-fronted Weaver is a monogamous, solitary nester, or it may form small colonies. The nest is a large, untidy ball of dry grass with a long entrance tunnel on the side. The nest is lined with finer material and a few grass seed heads, and rarely with feathers. The nest chamber is formed by trampling material. The nest is sited in Ziziphus shrubs, or in branches of acacia trees, 2-6 m above the ground. Nests may be sited near wasp nests. Clutch size is 2-4 eggs, with generally 2 near its northern limits and 3-4 further south. In one record of nest predation, 4 nests in Kenya were raided by a pair of wood-hoopoes which ate several eggs. Active or old nests of the Speckle-fronted Weaver may be taken over for breeding by Red-cheeked Cordon-bleau Uraeginthus bengalus.